The Roller Coaster Kid (Viking). Instructions for entering the Giveaway will be at the end of this post. writing." (Crock pot not crack pot.) I think of my creative mind as a slow cooker, simmering with various ingredients, on low heat. Every now and then I lift the lid, give the brew a taste test, to see if "it's soup yet?" (Those of us of a "certain age" will remember that line from the Lipton Cup of Soup commercials.) Mostly, the answer is no. The lid goes back on until next time. The Roller Coaster Kid's "ingredients"come from such diverse sources, I didn't realize I was even writing a book, until the final "ingredient" presented itself in one of those rare Eureka! moments. West View during the Depression. That good looking fella to the left is my Uncle Andy, working the Milk Bottle Pitch kiosk. 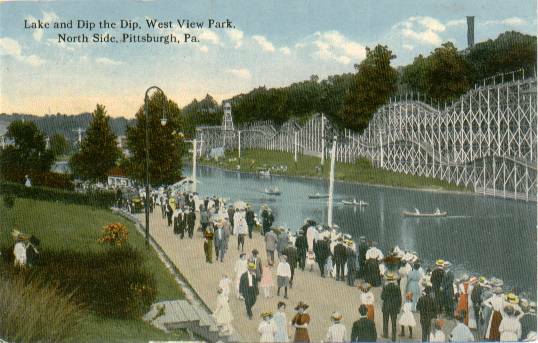 West View was one of the first amusement parks, built in 1906. Since it was literally around-the-corner-and-down-the-hill from my Grandmother Smith's house, it was the only amusement park I knew as a child. Of course I had heard about Disneyland (this was waaaay before Disney World or any of the modern "theme parks") but that was in California, for crying out loud. I lived in Chicago and my relatives all lived in Pittsburgh. Only rich kids or Californians went to Disneyland. I didn't know anyone who had been to California let alone, Disneyland. Growing up in Chicago, I did see TV ads for Riverview Park, which was roughly the same vintage as West View. Every summer I begged my parents to make the trek from the Southern Suburbs to the North Side of Chicago, but somehow I never got to Riverview. As my mother reminded me, "Why would you want to go to Riverview? It's just like West View, and you can go to West View with your cousins." Mom had a point. A trip to West View was always a big occasion, including at least a half of my dozen plus cousins living around Pittsburgh. A big occasion, which in true 1950's fashion, involved wearing Sunday School clothes, crinolines, patent leather mary janes and all. How those clothes survived the Bumper Cars, Tilt-a-Whirl and the Round-Up, I don't remember. I do remember that most fearsome of all the rides, West View's gigantic wooden roller coaster, The Dips. Being tall enough to ride The Dips was a real milestone. And if you could ride The Dips without throwing up....well, you were practically a teenager. I think I rode it once or twice before the park was torn down in 1977. I suppose you could say that my memories of West View Park were the basic "stock" of the soup that became The Roller Coaster Kid...a book I didn't realize I was writing. 1. 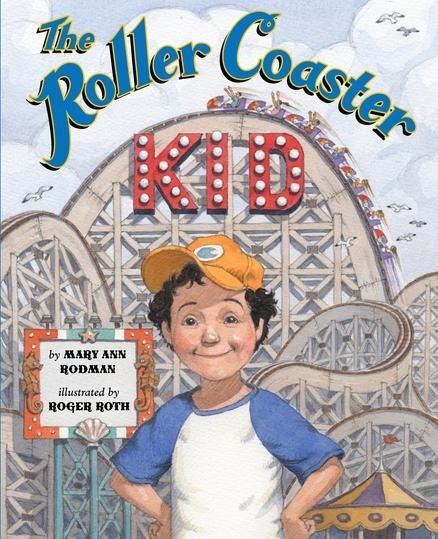 You must comment to today's post, telling us why you would like to win The Roller Coaster Kid. Will you be keeping it for yourself or sharing it with another young reader? Addition from Carmela: or you may enter by sending an email to us at teachingauthors [at] gmail [dot] com with "Book Giveaway" in the subject line. 3. You must send us your post by 11 pm (CST), Wednesday, July 25. Winner will be chosen at random via Random.org. and announced on Thursday, July 26. Note: Winners automatically grant us permission to post their names here on the TeachingAuthors website. Those are the official rules. If you feel like sharing an amusement park memory, that would be great, but certainly not required. I've already told you mine in today's post. I can't wait to hear your memories. More on The Roller Coaster Kid Wednesday. I'd love to share this book with my two girls, ages 7 and 4! I also have favorite memories of a nearby amusement park. My brother and I would measure ourselves against the stick at "The Viper" each time to see if we were finally tall enough! I'd love to share this book with my 2 children. Hi Mary Ann, I read your two mgs and would love to read your new pb! And yes, I will gladly share with my niece and nephew when finished. I'd love to win the roller coaster kid because I've read both of Mary Ann's novels and know she's quite talented. 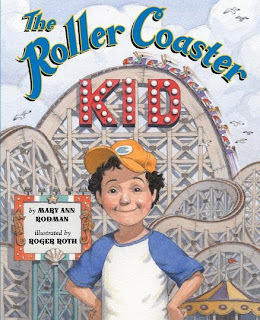 I would get Mary Ann to autograph The Roller Coaster Kid at the SCBWI conference and then proudly display it in our school library. My wife and I used to go on them all the time but she has lost her taste for dangerous adventure. I still indulge when I get the chance. Most likely, after the book has been thoroughly enjoyed around here, it would make it's way as a donation to the local public library as so many of our favorites do. Hey I used the wrong form of "it's" in my comment. It's its, not it's - get it? I would share this book with my fearless granddaughter, then have her donate it to her school if she wished. I remember being scared of roller coasters but rode them with my cousins. Now my fearless granddaughter rides them, but not with her "fearful" grandmother. I love the look of 'The Dips'-how awesome. I grew up going to one of those old amusement parks in Kansas City, Missouri-called Fairyland, with an old wooden roller coaster. Here in Colorado, we moved just in time for my children to enjoy some of the famous Elitch Gardens before it was sold to the Worlds of Fun franchise. We still have one old park left, Lakeside, with just amazing neon lights at night. Old memories! I would share your book with the teachers I work with, after reading of course. 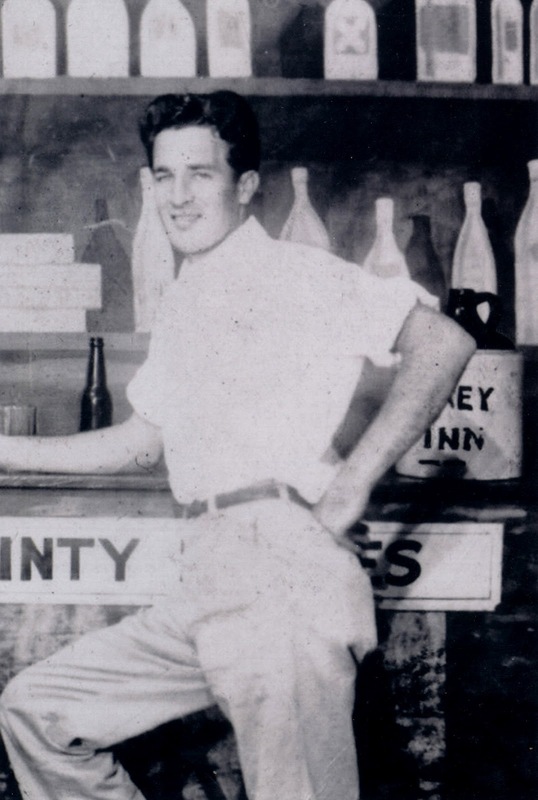 Thank you for the nice post filled with family memories.